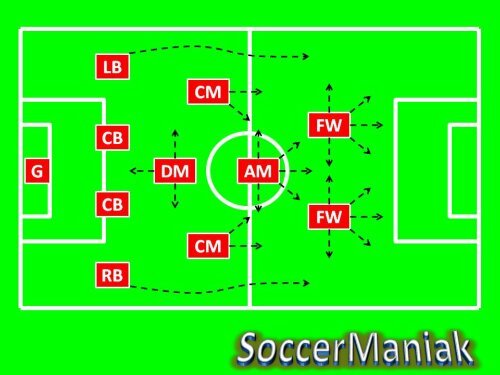 4-4-2 Soccer Formation is the most played soccer formation today. The strength of this formation comes from the overlapping outside backs (RB & LB) adding numbers to the attack and quickly converting this 4-4-2 formation into 2-4-4 or even 2-2-6. This is why the outside players need to be in exceptional physical shape. They will run the most on the team providing support to the attack with crosses and than running back to defend. The key to getting most out of this soccer formation is the outside players constantly overlapping the midfield creating extra players in the opponents side of the field. The two center midfield players will need to be no more than 20 YDS/M apart. One will usually play more defensive role while the other will provide support to the forwards. The weakness of this formation can be the flat four defenders that can be torn apart by quick and agile forward opponents that like to make diagonal runs behind the defense. Defenders will rely on the offside trap a lot so they need to work on verbal communication to learn to step up in sync. When defending, the whole defense needs to move together and close down space as shown below. If defense has trouble incorporating the offside trap or if the opponent is playing some very quick forwards than this 4-4-2 formation may need a little change by dropping one of the center backs behind the defense into a role of SWEEPER. 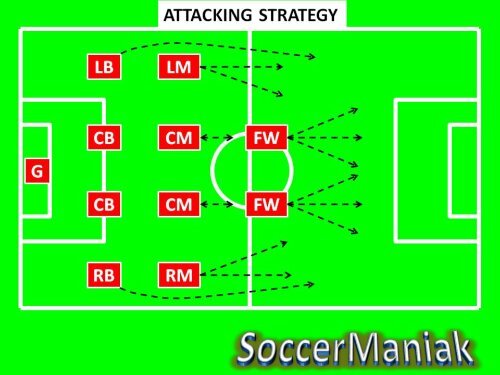 By doing this, attack will suffer with one of the outside backs having to stay back when attacking because the SWEEPER will not have man marking responsibilities. 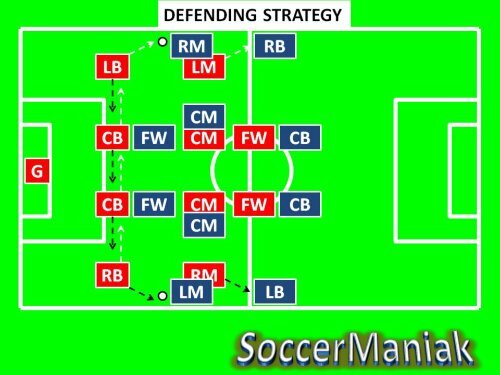 If the attack is developing on the right side, the RIGHT BACK will help the offense by running forward while the LEFT BACK will stay back and help the defensive line or vice versa. Playing with a SWEEPER basically makes it the 1-3-4-2 soccer formation. Another very popular way to play this 4-4-2 soccer formation is with a diamond midfield providing more versatility in the attack by having one attacking midfield and more support to defense by having one defensive midfield with two central play-makers. With this 4-4-2 soccer formation diamond midfield, Outside Backs (LB & RB) will have more freedom to attack and can both go up the field at the same time because of the defensive midfielder now in play (DM) helping the defense by slowing down the attack in the midfield. The center midfield players will be play-makers that have great passing ability and great vision to notice teammate runs and provide passes. They will also have more freedom to attack because of the defensive midfield position behind them. The downside to playing with this formation is the fact that the midfield is spread out into a more attacking formation allowing opponents to attack and take over the midfield in counter attacks or on the sides. All in all playing with 4-4-2 soccer formation great will depend on how fit the outside backs are (RB & LB) and how well the defense communication is to close down empty space. You can experiment with different ways to play this formation with the players that you have. It is a team game and every player needs to pull their weight on the field to make any formation work. It is up to you as a coach to see the strengths and weaknesses of your players and to position them accordingly.